As my 2011 review of his Where Good Ideas Come From: A Natural History of Innovation proves, I am a Steven Johnson fan. So it was with relish that I settled in to read his latest release: Future Perfect: The Case For Progress In A Networked Age. Steven had already told me the premise of his book – the first he’s written since moving to my neck of the woods in Marin, California (I hope we can keep him from going back to Brooklyn, but we’ll see…). In short it’s this: the evidence has become overwhelming that a new form of political expression is developing, an expression deeply informed by the gravitational pull of the Internet (for more on that, see Steven’s piece in the Times: The Internet? We Built That). …We believe in social progress, and we believe the most powerful tool to advance the cause of progress is the peer network. We are peer progressives. Johnson’s use of the term “Legrand Star” is a reference to one of two consistent tropes throughout the book: A “Legrand Star” is a centralized, hierarchical approach to problem solving or decision making (named after the French rail system, which ran out to the country in direct lines from Paris). A “Baran Web” is a decentralized, peer network approach (named after Paul Baran, an early Internet pioneer). 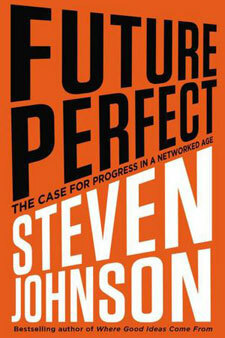 As Johnson notes in the book, Future Perfect is something of a career-long work – his examples all stem from things he’s noticed over the course of more than a decade of writing books. It’s as if he had a big folder of anecdotes gathered over the past 15 years, each labeled “This must mean something,” all patiently waiting to be turned into this book. Like many of us (I will admit an easy attraction), Johnson has for years felt disconnected from the political process. The polarization of political discourse seemed detached from what many of us were feeling on the ground – example after example of good things getting done by networks of diverse people working toward common goals. In Future Perfect Johnson organizes proofs of such work, some well known (Wikipedia), others surprising (he reinterprets the “Miracle on the Hudson” river landing as the work of an extended peer network. You’ll never think of frozen chickens in the same way again). In this book Johnson acts as something of a peer progressive Johnny Appleseed, each new narrative another seed which plants the concept more firmly in a reader’s mind. Employee-owned companies perform better than Wall St. driven firms – peer networks for the win. Prize-driven, open-source advancement of science births commercial space aviation, and may solve even larger issues like our society’s approach to pharma research – again, peer nets FTW. Our cities are clogged with traffic, peer networks can re-route our transportation grid. Our news is Legrandian, but peer networks can not just save journalism, but improve it to the point of far higher value to each citizen, down to the hyperlocal level. Patents are a blight on true innovation, peer networks are helping us clear our intellectual property acne – peer networks FTW! The modern regime of big corporations and big governments has existed for the past few centuries in an artificial state that neglected alternative channels through which information could flow and decisions could be made. Because we were locked into a Legrand Star mind-set, we didn’t build our businesses and our states around peer networks that could connect us to a much more diverse and decentralized group of collaborators. Instead, we created a mass society defined by passive consumption, vast hierarchies, and the straight lines of state legibility. It didn’t seem artificial to us, because we couldn’t imagine an alternative. But now we can. But after reading Steven’s book, and living through many of the same stories as has he, I have to say, I wholeheartedly agree. Coming up: Regenesis: How Synthetic Biology Will Reinvent Nature and Ourselves, and City of Golden Shadow (Otherland, Volume 1). “Third way” is oldest story in the political book. Politics is obsolete in a high tech world. Coercion does not work. Never has. Never will. All political action involves coercion. It involves using the threat of violence to force people to do things the way your crowd thinks is best. Problem with libertarianism is that it is not radical enough. I love it when people say they’re looking for “non-market” solutions. The market is simply the sum total of all non-coercive interactions in a given society. I repeat: coercion does not work. Markets do. I think you’re at least partly singing Johnson’s song here. Previous Previous post: Must All Grasshoppers Die?